Recently Bert got obsessed with a dip/sauce that he bought from a deli in Cardiff. He LOVED it! but then, sad times, they stopped selling it. he spend a while looking online to find a similar sauce... and managed to order some but the postage was pretty steep. so being best wife of the year I decided to make some. and apparently it tastes the same! possibly it tastes better! and wow, is it a simple dip - but it does taste really good and you can have it on it's own or in sandwiches - kinda like how you'd eat chutney. and all you need to do is chop up the veg and roast them. when they are soft wizz them all up in a blender with olive oil and salt and pepper. so, it's the time of year to look back and then look forward. we had a good time! highlights of 2014 were going to End of the Road festival with shelley and pete where we saw great music and had a lovely time. we also went to Hay festival and saw the amazing Siri Hustvedt and Lorrie Moore. my mum had a big birthday (that's her in the middle!) and we had a celebration with all the family. I also really enjoyed yoga in the park over the summer with yogafever (and their hot yoga classes in general), and went to new yoga classes at sara's classes at pontcanna dojo and elite fitness . and of course there were all the little things which make up a life - spending time with the ever-lovely bert, and of course sadie-cat who continues to be a delight and a monster. buying books, reading books, watching movies, watching boxsets, going out for dinner, drinking coffee, and nice chats with bert and other favourite people. work was a little challenging this year... as we had a 'restructuring' which meant that some people lost their jobs. I changed jobs and while there were many positives to this (including working with lovely new people) I did find the whole experience pretty stressful and overwhelming. I've been thankful for this christmas holiday, as I was feeling run down from work. I'm starting to feel more refreshed now and ready to begin the working year anew. we are hoping to go to Venice for the biennale. today I am reading a really fun book called Rebel Belle by Rachel Hawkins and baking cookies. I hope 2015 treats you well. this is a picture from christmas eve. we have a small pink christmas tree and mugs to match. I've had a busy year with not much time off and now I have a few days off in a row I feel like it's all caught up with me. I have a bit of a cold, and my eustacian tube dysfunction (blocked ears!) has kicked in. i'm fine really, but I'm taking some time out to sit in on the sofa, read books, watch cooking programmes and make my way through my new box set I got from bert for christmas - Witches of East End. Bert made me the hot toddy in the picture. It's got whiskey, lemon, agave, water and cinammon in it. I don't really like whiskey but this was yum. also it made me feel immediately better (the whiskey?). I'm putting my order in now for another one tonight. how pretty are these snowy books? I love all the whites and blues. I have always loved to read about snow, but after spending three months one winter in Quebec, I got obsessed with it. When I was in Quebec it snowed every day. gosh. So this one (The Idea of North by Peter Davidson) I haven't read. I've had it for ages and have started it a few times, and just flicking through it now I'm thinking, hmmm, this looks interesting. 'It is winter here and I am inside with the tulips' - Sylvia Plath. 'The Snow Tourist' by Charlie English is more like an encylopedia of snow! in it, English goes looking for snow around the world and writes fascinating stuff about it. It also has a lovely section in it called a 'snow handbook' where the author writes about how snow is made, different types of snow flakes, a list of snowy books and snowy movies and how to build an igloo. I read this a while ago, but looking at it now makes me want to re-read it! Arctic Dreams by Barry Lopez is a classic. Read any book on snow and Arctic Dreams will be listed in the bibliography. It's a mixture of travel and and history, and is really remarkable. It covers the history of the Inuit and of explorers and also looks at natural history, landscape and imagination. wonderful stuff. now I want to re-read this too! any suggestions for non-fiction (or fiction) winter/snow books? I love reading wintery books in winter and am hoping it will snow soon too (there's a rumour going round that it will). I am always on the look out for christmas or winter reads, so if you know of any let me know. One of my favourite wintery reads that isn't pictured here is by Tove Jansson (of Moomin fame) and called 'A Winter Book' - it's a collection of beautiful, slow, dreamy wintery stories - you'll love it. It seems that everyone is reading 'My True Love Gave to Me' at the moment. I bought my niece a copy and then wanted one for myself . I've been reading it since Christmas eve and have nearly finished it. I know that the cover looks a little fluffy, but there are great stories in here. So far my favourites have been the stories by Kelly Link, Holly Black and Matt de la Pena, and am also looking forward to reading the Laini Taylor one. I recently re-read 'Northern Lights' by Philip Pullman for reading group and I enjoyed it second time round just as much (if not more). This is a wonderful book (and the first in 'His Dark Materials' trilogy) which feels like it's a classic already. I adore the daemons and the polar bears, and half way through it gets super snowy so fits in with the festive theme. I haven't read 'Mystery in White' by J Jefferson Farjeon yet but it looks good! This is bert's copy as he loves a bif of cozy crime and it's also been promoted a lot in Waterstones this year so you may have seen it. It was written in 1937 and has been out of print for ages. It's a story about a heavy snowfall on Christmas eve that brings a train to a halt, some of the passengers take refuge in an empty house... and then there is a murder! yelp! Rock Crystal by Adalbert Stifter is delightful. I have given this as a gift to few people and they all love it. 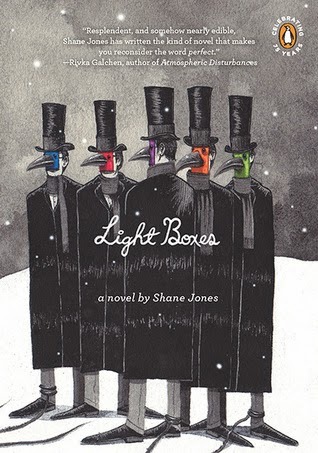 If you try one of these wintery books, make it this one! It's a short book at only 76 pages and reads like a fable or a folk story. It's about a brother and sister who go to visit their grandparents in the Alps on Christmas eve and on their way home it starts to snow heavily and the children get lost. I'm not sure when this book was written but I think it was around the 1840s or 50s as Stifter lived between 1805 and 1868 and published his first story in 1840. This book is so beautiful and snowy and the cover is gorgeous. So, 'Let it Snow' starts off the same as 'Mystery in White' - a huge snowfall and a stranded train, but instead of murder there is romance! This novel consists of three interlinked stories written by three different authors and it's an utter delight. I mean, everyone loves John Green right? and we pretty much all love Maureen Johnson too... and although I'd never read any Lauren Myracle before, I enjoyed her story too. tomorrow we'll chat about wintery non-fiction, k? of course. 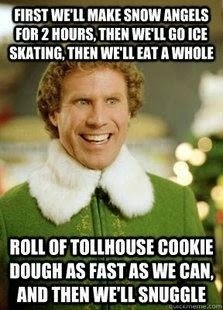 Everyone likes Elf right? I have pretty much watched Elf every year since it came out - it continues to be funny, charming, heartwarming, sweet and christmassy even with many, many viewings. I also really love the way it looks - especially at the beginning in the North Pole with all the outfits and snowflakes. First off, lets talk about Vince Vaughn. I really, really love Vince Vaughn and I really don't understand my feelings for him as essentially he is not my type, he seems pretty blokey, is right-wing and also in really really bad films. Maybe 'love' is the wrong word... perhaps its more 'fascinated' by him, and by fascinated I mean I will watch every godawful film he is in because he captivates me. I think he might represent for me the really popular jock who wouldn't have looked twice at chubby, nerdy asthmatic sian back in school.... I may need therapy. But Fred Claus right? gosh. this is a really good film! this is kind of in the territory as Elf, and while not as perfect as Elf it comes close enough. Also, not so many people have watched this film... lets rectify this shall we? 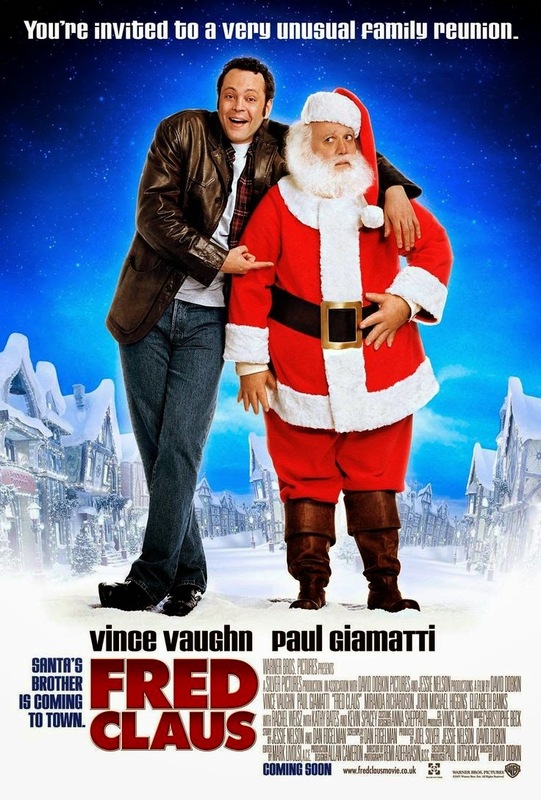 Vince Vaughn is Fred Claus (Santa's older brother) but he's pretty anti Christmas.... he needs cash so goes to the North Pole to work for Santa and there he does some dancing...and even helps an elf fall in love. This film has really great actors in it! aside from the great Vince it also stars Paul Giamatti as Santa, Kevin Spacey, Rachel Weisz and Kathy Bates. I have only seen this film once. Me and bert watched it in chapter a couple of years ago. 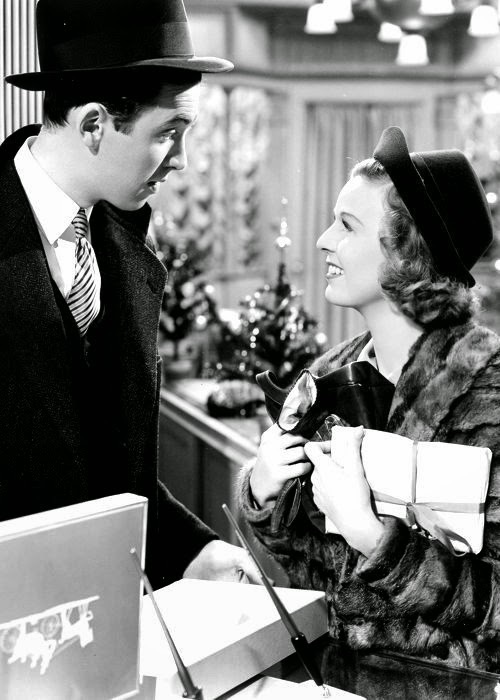 This film is from 1940 and stars James Stewart and Margaret Sullavan - two people who work in the same shop together and hate each other, but have also been falling in love through the anonymous letters they send each other. sounds cute huh? and does it sound familiar too? that's because it was remade into 'You've Got Mail' in 1998 starring Tom Hanks and Meg Ryan which is a film I LOVE, but which Bert isn't sure about, as a big corporate chain bookstore takes over the little local bookstore. Anyway, totally charming and we need to re-watch it. so... you know I said we liked watching the Hallmark Christmas movies? or just the trashy movies that are on of an afternoon around this time of year? or so it seems. because actually it totally TRANSCENDS the afternoon movie genre! 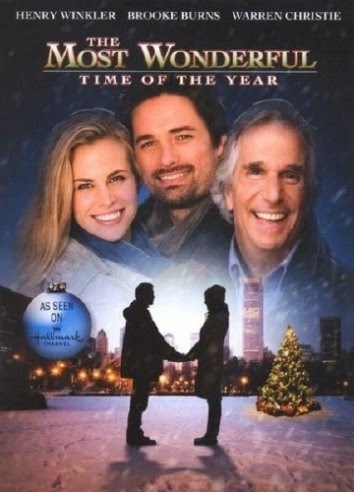 first off it has Henry Winkler in it which I think adds a touch of gravitas. Henry is going back to his pretty blonde niece for Christmas (she has an obnoxious boyfriend and a cute son) and on the way meets that dark-haired hottie on the cover. Winkler knows they are perfect for each other, but will they get together before the snow melts??? also it is exceptionally romantic. of course Muppets Christmas Carol has to be on the list. 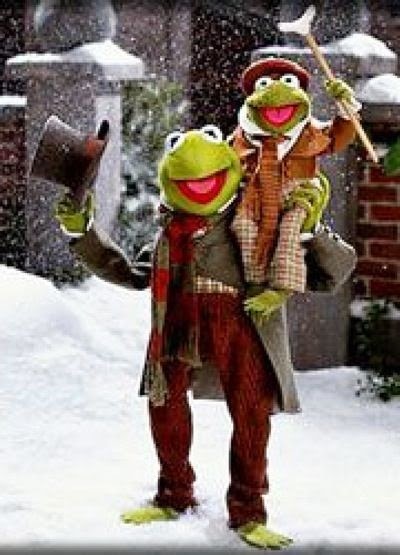 This is Bert's favourite christmas film and he gets a little teary at the end every time he watches it. Hello! And happy Christmas. Me and bert have just had a festive Christmas eve lunch, and I may or may not have had quite a bit of 'pink fizz'. Oh gosh. I think secretly this might be my favouritest Christmas song of all time! Bert mocks me about this one and says it's awful... But then I say 'I like the sentiment' and bert says, what? The sentiment of some really boring guy driving home from work? And then I think he'll never understand me. Anyway.... I've worked a lot in retail over the years and therefore worked a lot of Christmas eves (I'm looking at you Body Shop, Ottakar's and Waterstones) , which has resulted in a lot of last minute driving home for Christmas shenanigans. I heard this song the other day when I was shopping and it gave me shivers. How can something so wrong be so right? Another Classic right? I genuinely love this song. When I spent a year in university in York me and my housemates used to put this on over and over again in the Grange bar (or, as we called it the 'Strange bar ') and I'm pretty sure it wasn't christmas. Aw! Shakey! He was big back in the day when I was in primary school in Llanilar, my friend Fiona even had a poster of him on her wall that she used to kiss every night. This song wins because it reminds me of being little. I distinctly remember having a 7" of it in my Christmas stocking which said 'happy Christmas to sian love Santa' on it. Plus the song is awesome, right? I hope your Christmas tree lights up your world..
sadie, food, reading, crafting, drinking out of cute mugs, having a bellini. I am making christmas decorations today and next weekend, and am going to london tomorrow for the Bust Craftacular. 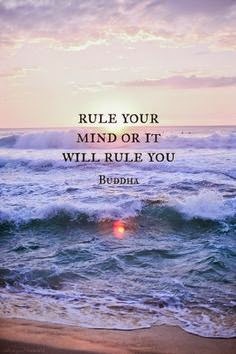 I keep thinking I should, as all the great people seem to meditate every day. apparently it's good to mediate twice a day for forty minutes each. that sounds like an awful long time. So my plan for December is to meditate every day for ten minutes a day, and then maybe if I feel like it I can increase the time. So far I have managed four days in a row.... I set the timer on my phone for 10 minutes, sit cross legged, close my eyes and breathe. and that's it. Ten minutes can feel like forever, but I'm already finding it easier. I don't know much about meditation, so if anyone has got any tips or book suggestions that would be great. Recently I've been reading books by Thich Nhat Hanh which I've been really loving and I've also been reading about plum village - his mindfulness retreat centre, I so want to go there! if you haven't read any of his books, give them a try, both myself and oprah are fans. here are the books I read in November. most of them were from the library, hurray for the library. Landline by Rainbow Rowell - this is the fourth Rowell book I've read (which means all of her books so far) and I think this was my least favourite so far. (tho still totally readable and fun). It was about the possible disintegration of a marriage and also a magic phone which enabled the married couple to converse as if it were the beginning of their relationship - can they fix their marriage if they go back to the beginning? hmm. I dunno, I found the 'magic' phone to be a bit ridic. it's a dark little fairy tale/fable type book about a town where it's always february. This is a perfect book to read on a snowy day in december - do it! Near to the Wild Heart by Clarice Lispector - really wanted to like clarice, but it was possibly a bit too stream of conciousness for me. Dreamy and gorgeously written... and despite my difficulties with it, I would still read more by Lispector. Tiny Beautiful Things: Advice on Love and Life from Dear Sugar by Cheryl Strayed - so yes, this the Cheryl Strayed that wrote Wild, which is great and you should all read it! you know what? you should all read this too! Essentially it is a collection of advice columns that Strayed wrote under the pseudonym of 'Dear Sugar' for an online magazine. So it kind of doesn't sound that it would be that great, but it is! it's so wonderful and heart warming and I'm going to buying this as a christmas gift for a few people. Strayed answers readers problems so beautifully and with such warmth and also brings in stories from her own life. oh, and it's not in the slightest bit schmaltzy or cheesy, it's more a tough love kind of advice. Little House in the Big Woods by Laura Ingalls Wilder - I've never read these before (or watched the tv show) and it's so goddam cosy! sure, there's a wee bit more animal slaughter than I would like and a touch of racism (gulp), but aside from this... it's so cosy! snow, baking, sewing, christmas with family... sigh. I'm going to be reading more of these! Regeneration by Pat Barker - this was our reading group book in work. Most people liked this book, but it just didn't happen for me. I found it really tedious and unrealistic but I feel bad saying that as it's about the first world war and all. Yes Please by Amy Poehler - we all love amy poehler right? but maybe we don't love her book qutie as much. A fun and easy read which has some great celeb stories and funny bits, but didn't all quite hang together. Over Easy by Mimi Pond - a graphic novel! yay! why haven't I been reading graphic novels recently? no one knows. This is about dropping out of art college and working in a diner in 70s California. yes? yes! so there you have it. That's what I read in November - have you read any of these? I'm hoping to read another 10 books this year to match last years total, and I also want to just read cosy, wintery, christmassy books, any suggestions?